With a motto like ‘thoughtfully designed,’ you can be assured that every item made by Aspenhome is built to exacting standards. Carefully crafted out of only the finest materials, furniture by Aspenhome combines the best in traditional and transi View more tional design with quality you can be proud of. 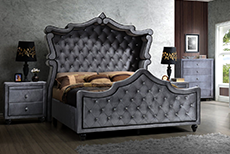 From elegant, classic home office suites to bedroom sets for the entire family, they have an extensive collection of functional family furniture that’s designed to last. If you’re looking to outfit your all-American home with classic basics packed with details to impress, you need to look no farther. With a motto like ‘thoughtfully designed,’ you can be assured that every item made by Aspenhome is built to exacting standards. Carefully crafted View more out of only the finest materials, furniture by Aspenhome combines the best in traditional and transitional design with quality you can be proud of. From elegant, classic home office suites to bedroom sets for the entire family, they have an extensive collection of functional family furniture that’s designed to last. If you’re looking to outfit your all-American home with classic basics packed with details to impress, you need to look no farther.